Well, folks, the end of the world is nigh, and due to the short warning issued by the religious authorities, there has been little time to prepare for the impending demise of the human race. It’s too late for that long-postponed Caribbean cruise. Don’t even bother paying the mortgage or your credit card bills, because in heaven everything is free and in any event you will be beyond the reach of creditors and collection agencies. However, you might want to keep your cell phone account current in case the trip takes longer than expected. Also, in the event you end up spending some unforeseen time in purgatory, it would be prudent to pack a small bag with a toothbrush and a few clean socks and underwear. 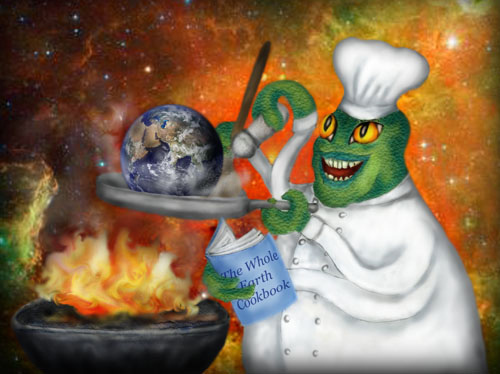 Here is a proposed menu that you can prepare to see out the end of the world with. By dinnertime, everything will be over, so the meal is designed to be a sort of “super brunch” which you should serve in the late morning or early afternoon, depending on your time zone. Better hurry to the supermarket and the liquor store because the word of approaching doom is getting out fast and all you may find for your last meal are Ball-Park Franks and Old Milwaukee beer.